At a time when forestry and vegetation covered the land, the first Christian monks made their journeys by boat. It is on record that some of the Corrib islands were home to religious communities such as one founded by St. Brendan and included names like Maeldún, Éanna, Cuana and Fursae. Many of the little churches or Teampaill here in Moycullen are named after the saints of the time or by them such as Teampall Beag or Teampall Phádraig in Cluain (n)Daimh Cill a’ Chlogháin – the little Church and Lisín in Corrach, Tullykyne Teampall Éanna – St. Enda¹s Church in Cill Eagúla. Éanna is patron of Aran, Spiddal & Barna Churches Cill Cáilín – Cnoc Bán, named after Cáilín a saint much venerated around the Connemara Coast “The Parish Church” so called by the historian R. O’Flaherty in his definitive work Iar-Chonnacht written in 1684. He describes the church as “The Parish Church, thereon its chief feast of late, is the Immaculate Conception, what ancient patron it had is not known”. Dr. Michael Browne, Bishop of Galway referred to this when he dedicated our present church to the Immaculate Conception in 1953. The dogma of the Immaculate Conception was promulgated in 1854 by Pope Pius X. In 1652 Cromwell and his army arrived in Galway. Their policy was to banish the Irish who held property. They banished the O’Flaherty’s of Moycullen Castle, sacked their property, which would have included “The Parish Church” regarded as an adjunct of the castle. The practice of religion was suppressed and the whole framework of the Gaelic civilisation and culture was annihilated. The first “Parish Church” in Moycullen was no longer a place of worship. In the early eighteenth century the Penal Laws were devised to deprive Catholics of property, of education, of the guardianship of children, of the control of land, to exclude them from the professions and from positions of influence. Permission to say Mass was said to be restricted to registered priests one in each parish (which was not always the case). All members of religious orders were banished. For Catholic ‘informers’ and for ’converts’ to Protestantism there was a system of pensions and rewards. Irish Catholics were reduced to misery and subjection. As in other parts of the country the priests in Moycullen continued their work in spite of grave and personal danger. We have the evidence of Bearna na gCorp where the coffins were blessed, the Mass Rocks, records of priests like Father Bartholomew O’Connor P.P. 1723 in hiding and Father O¹Halloran, stories abound about him. The Penal Laws were lifted towards the end of the 18th century. In 1793 Father Xavier Blake came to Moycullen as P.P. There is anecdotal evidence that a Church was then situated in Clochán (now the Regan’s land). In 1826 Father Peter Daly of Bushypark wrote in his pamphlet “I was entrusted by the Warden & Clergy to take charge of the parish of Moycullen under distressing circumstances which then had no chapel, and in the course of that year I built the present chapel. I had no emoluments by the office of P.P. of that parish during my care of it”. Built in times of extreme poverty this parish Church was also dedicated to the Immaculate Conception. Fr. Daly was reputedly a wealthy and influential member of the Galway Diocesan Clergy. His residence ‘Albano Villa’ in Bushy Park was known for the vital role it played during the Famine. The Galway Mercury (20th March 1847) reported that a 1000 people a day-received soup there, distributed by the Mercy Sisters. 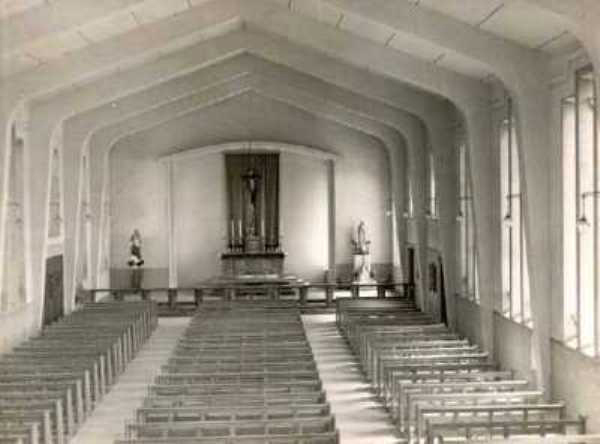 In 1950 it was decided to demolish Father Daly’s Church and to rebuild on the present site. As this required a larger site and the exhumation of fifteen people, their remains were re-interred under the Church. One young girl was found in much the same perfect condition as when she had died. Their names are recorded on Plaques, which can be seen on either side of the Church. These exhumations were very distressing for relatives, friends and neighbours of the deceased and for the gravediggers involved. 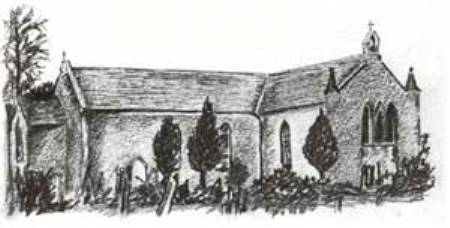 The present Church, the third parish Church which cost £20,000 was built on the small weekly contributions of the people of Moycullen with functions and events organised by the Priests of the parish, Fathers O’Dea and F.M. Higgins. Finally the collecting reached a total of nearly £9,000. Meanwhile Moycullen people in the States organised fundraising events, which coincided with Father Val Fitzgerald¹s visit. These raised £8,700. It should be remembered that fundraising in the 50¹s was not an easy task as it was a time of mass unemployment, poverty and emigration. The Church was designed and planned by Ralph Ryan, Consulting Engineer and Sean Kelly, Architect. Coogan & McNally were the Contractors. Bishop Michael Browne consecrated the new Church on the 8th December 1953, on the first day of the Marian Year. It was a splendid achievement for the priests and people of Moycullen and an example to us to day. We are the beneficiaries of a Christian inheritance.